Hooray! 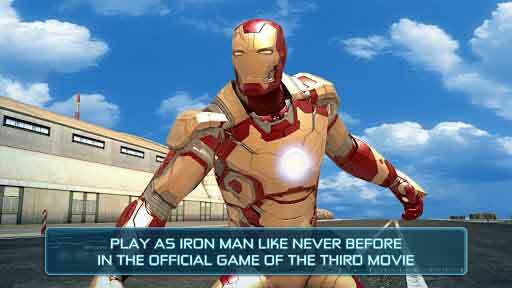 Official Iron Man 3 Game has released today for Android, iPhone and iPad by Gameloft. This game is created and designed based the upcoming Movie Iron Man 3. Iron Man 3 is free to download. Now get the action from Google play before the film hitting cinemas on may 3. So time to play the billionaire Tony Stark as Iron Man in this fast paced and endless runner story. You play the Iron Man and fight against rising A.I.M. forces around the world during amazing runs. In this fight, you will move in to different places such as Malibu Shores, New York City and China. Also, You have to save the world from the 4 epic villains Crimson Dynamo, Ezekiel Stane, Living Laser and the mighty M.O.D.O.K. of the Iron Man comics. In this game play, you can research and develop a monstrous 18 suits from the different movies including MARK II, MARK 42, Silver Centurion, etc. Also, you can research as tony in the Research lab to upgrade your armours to defeat your enemies. The Game will take you into the fascinating 3D world, there you can live through the cutting-edge graphics and animations. This Game is free in the Google store and the memory is pretty much high, but under 1 GB.